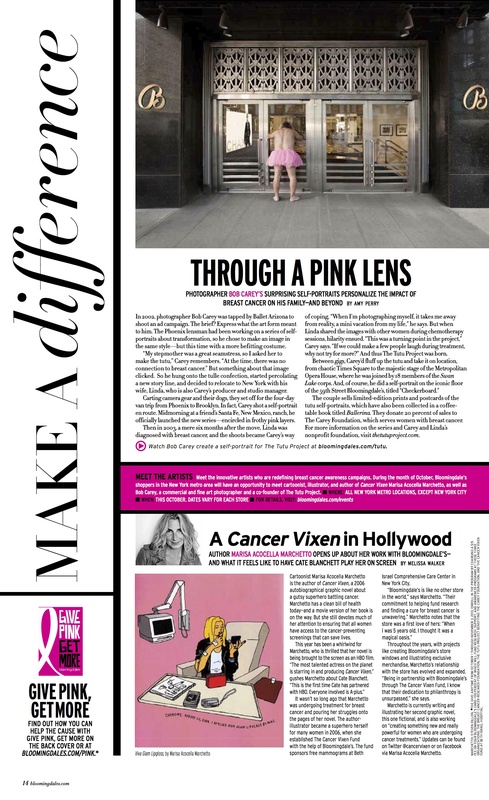 Thank you once again to the Bloomingdales team for their support during breast cancer awareness month. We are honored to be included in such amazing company. We’ll be signing books at different stores throughout this month. Stay tuned for more information! In 2002, photographer Bob Carey was tapped by Ballet Arizona to shoot an ad campaign. The brief? Express what the art form meant to him. The Phoenix lensman had been working on a series of selfportraits about transformation, so he chose to make an image in the same style—but this time with a more befitting costume. But something about that image clicked. So he hung onto the tulle confection, started percolating a new story line, and decided to relocate to New York with his wife, Linda, who is also Carey’s producer and studio manager. Carting camera gear and their dogs, they set off for the four-day van trip from Phoenix to Brooklyn. In fact, Carey shot a self-portrait en route. Midmorning at a friend’s Santa Fe, New Mexico, ranch, he officially launched the new series—encircled in frothy pink layers. Then in 2003, a mere six months after the move, Linda was diagnosed with breast cancer, and the shoots became Carey’s way of coping. “When I’m photographing myself, it takes me away from reality, a mini vacation from my life,” he says. But when Linda shared the images with other women during chemotherapy sessions, hilarity ensued. And thus The Tutu Project was born. Between gigs, Carey’d fluff up the tutu and take it on location, from chaotic Times Square to the majestic stage of the Metropolitan Opera House, where he was joined by 18 members of the Swan Lake corps. And, of course, he did a self-portrait on the iconic floor of the 59th Street Bloomingdale’s, titled “Checkerboard.” The couple sells limited-edition prints and postcards of the tutu self-portraits, which have also been collected in a coffeetable book titled Ballerina. They donate 20 percent of sales to The Carey Foundation, which serves women with breast cancer. For more information on the series and Carey and Linda’s nonprofit foundation, visit thetutuproject.com. I LOVE that photo. What a blessing you have been and did you ever think your life would culminate in such a manner? Very cool – I already signed up for this! !